Youngsters taking part in the Good Friday Easter Egg Hunt at Kew Gardens in the Beach this Friday, April 19, will have a chance to see the Easter Bunny. Photo by Alan Shackleton. The second annual Good Friday Easter Egg Hunt will take place at Kew Gardens in the Beach on Friday, April 19 from 11 a.m. to 2 p.m. 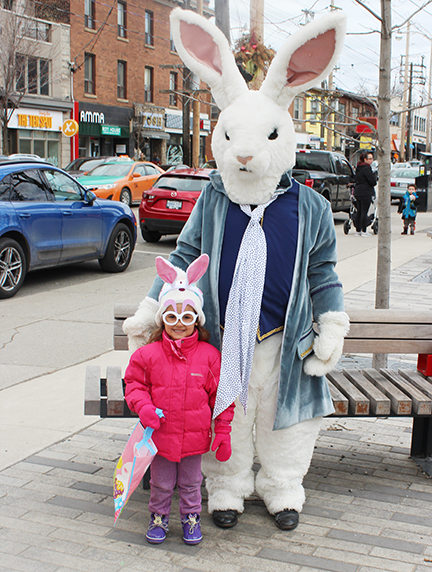 The egg hunt is part of the festivities surrounding the annual Toronto Beaches Lions Club Easter Parade which is set for the afternoon of Sunday, April 21. The Good Friday Easter Egg Hunt will feature children’s entertainment and, of course, a visit by the Easter Bunny. Entertainment will include Juno-award winning group Sonshine and Broccoli, and a performance from Peppa Pig. The Good Friday Easter Egg Hunt is free to attend, and participants do not have to register in advance. Free face painting for the kids will be provided by volunteers from Community Centre 55. Jade Maitland, Community Centre 55’s special events and volunteer coordinator, said the Good Friday Easter Egg Hunt will be a special one. The event is organized by Lido Chilelli, who also organizes the Beaches Jazz Festival. He said this will be something children will be looking forward to. “I definitely think it will be like Disneyland in the Beach,” Chilelli said. Kew Gardens is located on the south side of Queen Street East between Lee Avenue and Waverley Road.